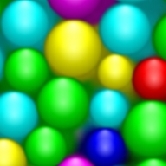 Using your mouse click on a bubble that is touching a bubble of the same color to clear them. Under normal mode you must clear 100 bubbles to pass the level before the timer runs out. In speed mode you have 60 seconds to see how many point you can gain. Under time mode you test your speed to see how fast you can destroy 500 bubbles.